That means we get that glorious balance of daytime and nighttime all over the world — from the equator extending to the poles — with just about 12 hours of each. Spring equinox 2019 is coming on Wednesday, March 20, and it’s eagerly awaited around the globe. For people in the Southern Hemisphere, especially in Australia, where they’ve been through a particularly brutal summer, it brings the blessed relief of cooler autumn days. If you ever hear anyone say “vernal equinox,” it means the same thing. The term equinox comes from the Latin word “equinoxium,” meaning “equality between day and night.” And vernal also comes from Latin and means spring. This bending of light rays “causes the sun to appear above the horizon when the actual position of the sun is below the horizon.” The day is a bit longer at higher latitudes than at the equator because it takes the sun longer to rise and set the closer you get to the poles. You get that truly equal day/night split a few days before the official spring equinox. That’s called the equilux. When is spring equinox — exactly? If you want to be totally precise, it occurs at 21:58 UCT (Universal Coordinated Time) Wednesday, March 20. That’s 5:58 p.m. ET in the United States. Click this link to plug in your location and determine your local time. Nowruz (Persian New Year): This is one of humanity’s oldest celebrations, going back thousands of years. Nowruz is a word in the Farsi language of Iran, and it means new day. Despite the tradition predating the rise of Islam by many centuries, it’s a national holiday in the Islamic Republic of Iran. 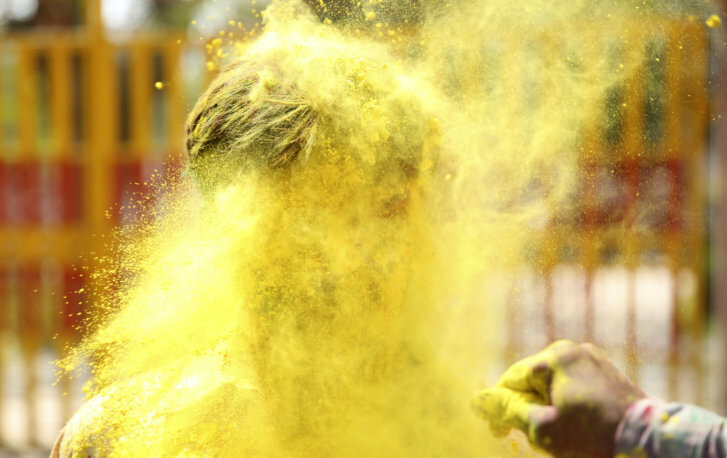 Holi: Yet another Asian religion — Hinduism — has an arrival-of-spring holiday. Holi a very old festival. The first known mention of it is in a fourth century poem. It’s a national holiday in India, and it is celebrated on the day after the full moon in the Hindu month of Phalguna. It’s not a uniform holiday — the start and end dates can vary by region and the duration of the celebration can be different, too. For many Indians in 2019, Holi will start on Wednesday, March 20, and end the next day. Easter: It’s no coincidence that Christians around the world celebrate the resurrection of Jesus around the same time that spring brings a rebirth to nature (in the temperate zones of the Northern Hemisphere, at any rate). At the “El Castillo” pyramid dedicated to Kukulcán (or Quetzalcoatl), the late afternoon sun creates the shadow illusion of a snake slowly sliding down the northern staircase. Thousands come here to witness this spectacle, and the day now has a carnival atmosphere, with music, dancers and more. During the spring and fall equinoxes, the rising sun is in exact alignment with the main doorway of the lower temple, which allows sunlight to fill the main corridor into the innermost altar. It’s a celebrated event on the island. This year’s vernal equinox has something special: The last supermoon of 2019. It’s called the Full Worm Moon, and it will rise on the same day as the equinox.